Knowledge management isn’t something that companies think of in the beginning stages. However, as a company grows, so does the amount of specific knowledge within the organization. Typically, simple company-specific information doesn’t take long to learn or to answer. Employees can find the answers by asking a colleague, or searching through company files and handbooks. But over time, those small moments begin to add up and can amount to a larger, more insidious time drain for your already time-strapped team. In addition, the answers you seek are often stored on different systems with different interfaces. They could even be in the hands of different people. Remembering how to navigate through them all can easily become a nuisance and a productivity drain. 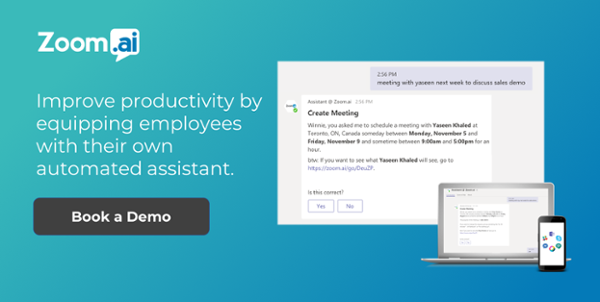 The newly expanded employee knowledge base feature from Zoom.ai can help reduce time hunting down answers. Instead of asking them to answer mundane, mindless questions, they can get time back to do their strategic work instead. From simple questions such as: “Where can I find my 401K contributions?” and “what is the wifi” to more difficult company-related knowledge such as “what are dividends?”, they can do it all through chat. So, how does it work for your enterprise? With Zoom.ai’s expanded enterprise knowledge base, admins can automate and easily configure responses to FAQs. We can even handle FAQs that may require multiple questions asked of the user, and then offer up a customized answer. These typically provide reduced inbound questions of major departments within your organization (consider employees in the HR and IT departments who often take repetitive calls or inbound questions). How easy is your onboarding checklist to find? How simple is it to give a new employee all the information they need? Make onboarding a new employee easier by having your team set up a helpful reference page and checklist can aide a new employee in finding their way. And if they can’t find the answer, then they can be nudged to get help. This skill is specifically helpful for high turnover type roles or when hiring large amounts of new staff. 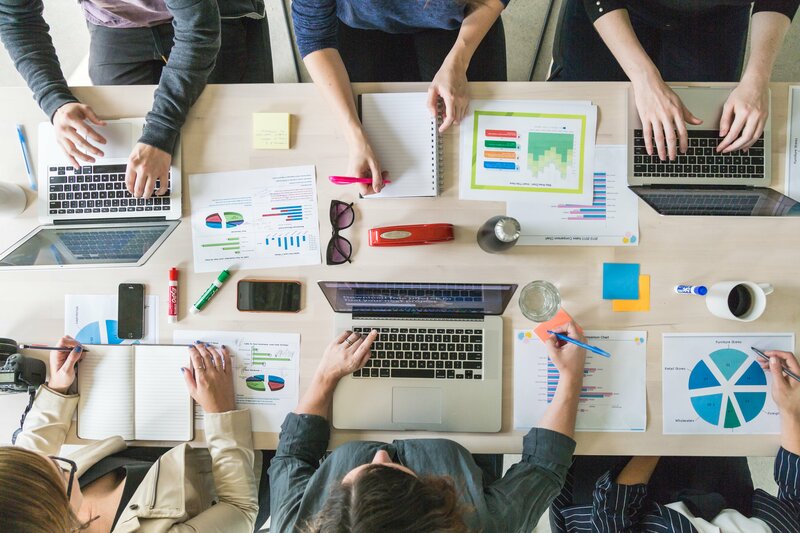 Mapping knowledge has been a long time goal for many organizations as they progress through their transformation roadmap. With Zoom.ai, enterprises can build their own knowledge base within our platform, and integrate into their existing solutions. This allows employees to search and find content in a flash by simply asking about the topic to their assistant. IT admins, easily build your enterprise knowledge base in the scalable Zoom.ai platform that feels intelligent – without having to consider change management processes for your entire organization. 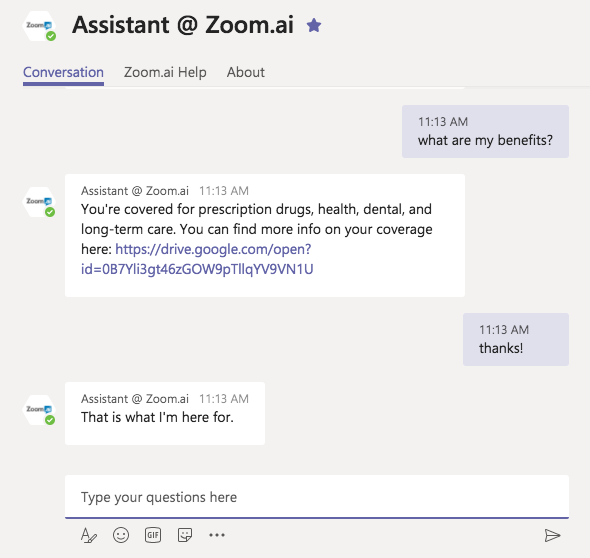 The Zoom.ai knowledge base allows enterprise employees to navigate the complexities and vastness of an enterprise knowledge base using natural language in chat. Beyond just a simple ask and respond, our intelligent system is able to take any query and intelligently route you through to the appropriate answer. Depending on the information you provide, your Zoom.ai assistant can bring you closer to the answer thanks to our intelligent backend. Above all, Zoom.ai solution can help you and your team work better. Learn how to install Zoom.ai on your chat platform of choice today in just three clicks. – Multiple options per question are sorted based on popularity.